Gov. Larry Hogan, left, and Comptroller Peter Franchot announce tax refund. Photo by Governor's Office. Republican Gov. 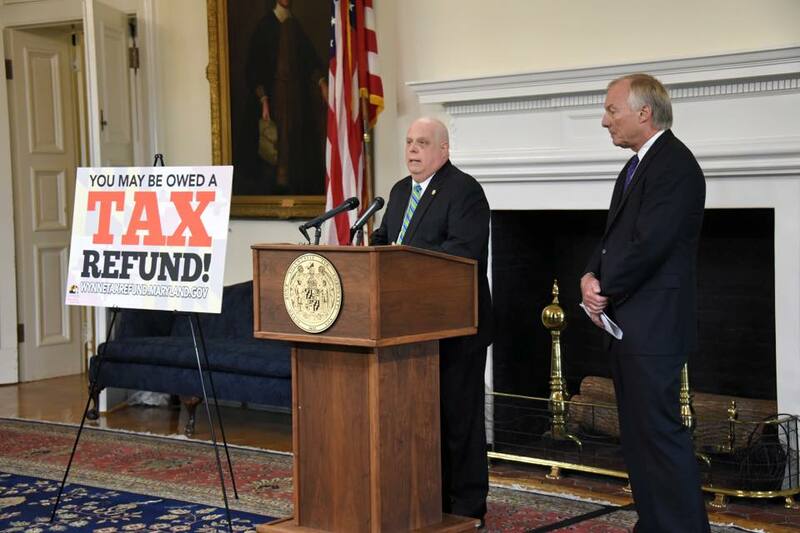 Larry Hogan and Democratic Comptroller Peter Franchot were at the podium in the State House Monday taking credit for a $200 million income tax refund that 55,000 Marylanders could apply for. But it was actually judges on the U.S. Supreme Court and Maryland’s Court of Appeals that should have been standing there, or even better Brian and Karen Wynne of Howard County who deserved the credit. The couple brought the suit that eventually led to a decision released in May that requires Maryland to grant the refund on piggyback taxes charged by counties on income earned in other states. In fact, the comptroller in his official position as the chief tax collector had actively fought the court cases which began seven years before Hogan took office. Maryland already gave taxpayers credit for taxes paid to other states, but that did not apply to local county taxes on personal income earned in another state. Both Maryland’s highest court and the U.S. Supreme Court found that unconstitutional. While the state collects the taxes, the counties ultimately foot the bill for the refund of their local taxes, with Montgomery County facing a loss of over $70 million in revenue. The state could have accepted the 5-2 majority opinion of the Maryland Court of Appeals, the state’s highest court, but the counties did not want to lose the money, and pressured for an appeal to the Supreme Court. The justices there also issued a split opinion, uniting liberal and conservative justices on both sides of the case. One of the goal’s of Monday’s press conference was to urge Maryland taxpayers affected by the ruling to apply for the refund, since it is not automatic. The governor’s office even created a separate website providing information on the tax refunds with links to the comptroller’s page and a new form. This situation does not apply to taxpayers working in D.C., Virginia or West Virginia since Maryland has reciprocity agreements with them, and they do not collect taxes on Maryland residents. This also applies to most people working in Pennsylvania. What to do about Baltimore’s high taxes? It is an old question perplexing Maryland political leaders, but with new urgency. And there have been precious few new answers. Some ideas were floated at a recent policy debate.